We’ve compiled the publications, documents and forms you need onto one easy page. If there’s something you can’t find here, don’t hesitate to call us on 03 8591 2200. We’re available to assist with any enquiries Monday to Friday, 8am – 5pm AEST. Our magazine for the BGS Community. If you’d like to be added to the mailing list, please contact Emily on 8591 2271 or email. View the latest issue – Autumn 2018 (external link). The Annual Brighton Grammar year-book with highlights and insights into the year that was. 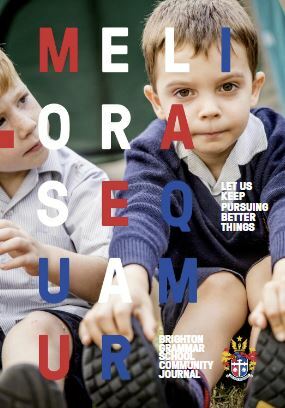 Designed to take pride of place on any bookshelf or coffee table and to be an instant collectible and suitable memoir of your time as a Brighton Grammarian. View the 2018 Grammarian(external link). View the 2017 Grammarian (external link). See prices and an application form for the Firbank bus services routes in 2019. View prices and an application form for the BGS bus services routes in 2019. There's something really special about a school just for boys. I love my school. Let me show you around on a Headmaster or Discovery tour day.